Q: What breeds of dog does Canine Companions use? All dogs in the program are Labrador Retrievers, Golden Retrievers, or crosses of the two. We ask all volunteer puppy raisers to be flexible regarding gender, breed or color to assure that every puppy finds a home quickly and efficiently. Q: Where does Canine Companions get their puppies? We have our own breeding program, based at the National Headquarters in Santa Rosa, California. Puppies are placed from any one of our regional centers and in some circumstances may be shipped directly to their puppy raiser. Q: I am 15 years old, can I raise a puppy? You must be at least 18 years old to be a volunteer puppy raiser. Those under the age of 18 must have a parent or legal guardian living in the same household as a co-applicant on the puppy raiser application. Q: Do I need a fenced yard? We strongly prefer that our puppy raiser homes have a fenced yard. Puppy raisers must agree to follow our supervision and leash requirements. Puppies must not be off leash at any time unless in an enclosed area. We don’t allow use of electric fencing. Q: What type of training will I do with the puppy? Puppy raisers must set aside time for daily training and attend obedience classes for the duration of the project. In some areas, we provide puppy classes free of charge. However, if you live in an area without a Canine Companions puppy class available, you must find and attend an approved public obedience class at your expense. Q: How much exercise do the dogs require? Puppies need physical activity in the form of play or walking. Puppy raisers should expect to provide at least 25-40 minutes of exercise per day. Canine Companions puppies are not allowed to visit public dog parks. Q: How old do you have to be to raise a puppy? The primary puppy raiser must be an adult 18 years of age or older. However, minors are allowed to raise with an adult co-raiser living in the same home. Note: Puppies can’t attend school with children in the household. Q: I work outside the home; can I still be a puppy raiser? Absolutely! Most puppy raisers gain approval to take the puppy to work. We recommend speaking to your employer prior to applying. The puppy will need regular toileting breaks throughout the day. Q: Can the puppy stay at home while I am at work? It’s imperative to the puppy’s development that supervision and socialization are provided throughout every day. Puppy raisers must either have prior approval to bring the puppy to the workplace or provide an alternative for the socialization and care of the puppy during the day. When left unsupervised, Canine Companions puppies should always be in an appropriate size crate. Q: Who takes care of the dog if I go out of town? In most cases, the puppy can accompany the puppy raiser on vacation, or can be placed with a sitter that meets our criteria. We offer guidelines for age appropriate travel outings and activities. Q: Does Canine Companions have any puppy raising policies regarding children or pets? Other pets are limited to a household of three dogs not including the Canine Companions puppy. All pets in the home must be well behaved, current on vaccines and over one year of age. Q: How does Canine Companions prepare individuals for their role as a puppy raiser? Each puppy raiser goes through an orientation process and is given a manual. We also provide ongoing staff support to each puppy raiser via phone, e-mail, or in-person follow-up. There is also a great community of support from current puppy raisers across the country. Q: Where do puppy raisers take the puppy in public? Puppies must be exposed or “socialized” to activities of daily life. This can include accompanying the puppy raiser to the work place, shopping center or other public places. When in public, the puppies wear a cape identifying the fact that they are being socialized for special purposes. However, we rely upon the goodwill of merchants and business owners rather than the legal system for gaining public access. Q: What type of training philosophy does Canine Companions endorse? We believe in the use of positive reinforcement combined with appropriate corrections. Our puppies are raised by their puppy raisers using Gentle Leaders© or other similar and approved head collars. Q: What happens if my living situation changes and I can no longer care for the puppy? Canine Companions maintains ownership of each puppy and our staff will find a new home for any puppy in need. Q: How can I possibly give him up when the time comes? You and the puppy you raise will take a long journey together! It’s only natural that you will become very attached to the dog. 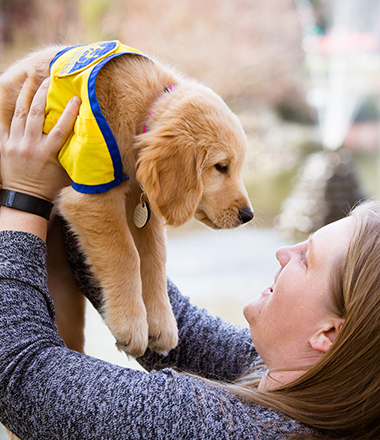 The ability to give up a dog comes from knowing that you’re raising this puppy for a purpose — that the puppy will go on to help someone with a disability lead a more social and independent lifestyle. Q: Will I get to meet the individual who receives the dog I raised? Canine Companions will make an effort to unite the puppy raiser with the assistance dog recipient. If an in-person meeting is not possible, we’ll pass along your contact information. Puppy raisers agree to provide food, supplies, vet care, transportation and related expenses while the puppy is in their care. These expenses are usually tax deductible. Canine Companions is often able to provide assistance for catastrophic veterinary expenses. Q: What if the dog is not placed as an assistance dog? In the event the dog is released from our program but found suitable for a working role with another agency, Canine Companions will transfer the dog to such an agency. Should the dog be unsuitable for placement in any working role, the puppy raiser may adopt the dog as their pet or Canine Companions will place the dog in an approved home from our release dog wait list. A $1,000 adoption fee applies to everyone other than the puppy raiser of the dog.